I’m not going to lie … I love chocolate and I really, really miss it! So, here is my way to get a bit of a chocolate fix in an allergy friendly way … and sneak some goodness in on the side! I really know that you can’t tell that it is avocado based because even my 2 little avocado haters wolf it down!! It’s an adaption of a recipe from ‘The Lunchbox Lady’. 1/3 cup milk of choice. Whizz it all together in the food processor until smooth. (Speed 6 in 10 second lots, scraping down between each time). Best served chilled. 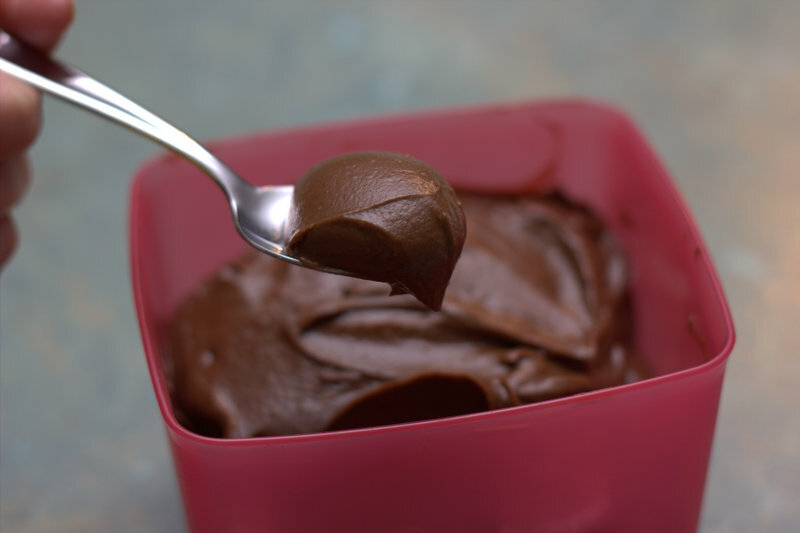 It keeps for a few days in the fridge or you can freeze it to make chocolate icecreams. Enjoy … I know I will! I am going to make this right now – thanks! Avocado and banana ice blocks are favourites in our house but a bit of chocolate has to be a winner! How did you go Neroli? Hope you enjoyed it as much as we do! Loved it!! It was a winner. Had to make a couple of small adjustments with the ingredients we have available in Tanzania but it was still great! Thanks. good news! Yes, I had to change it to fit the ingredients I could buy in the desert so I imagine it would be even trickier for you!! Let us know how you go. I think it might be a bit grainy unless your avo’s are super ripe. Good luck!